Rola's life has been filled with pain and suffering. You can see it in the horse's eyes and emaciated frame. He has all but given up on humanity and on his own life. 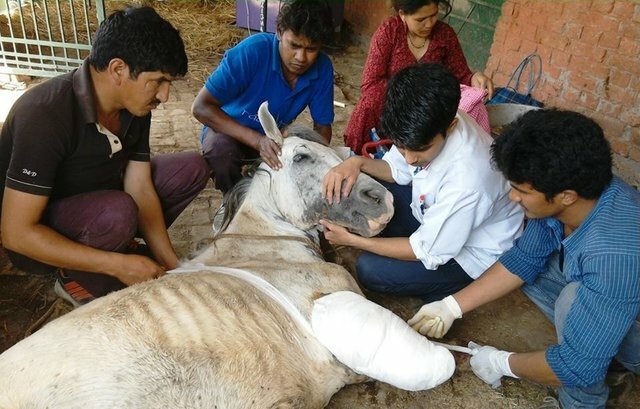 Recently found by a volunteer with Raahat for Animals, Dehradun, in India, Rola was lying near a hospital. The volunteer saw that the horse suffered from a hoof problem. Despite plans to bring him to the animal shelter, things took a turn for the worse. Before Rola could be transferred to the shelter, he managed to wander the streets searching for food in garbage dumps, according to Raahat's Facebook page. While on the streets, Rola had a terrible accident and was struck by a vehicle. "He suffered a fatal fracture in the elbow joint and was admitted at Raahat on April 9," the Facebook page stated. His medical condition was almost hopeless. The veterinarians who tended to his injuries suggested that Rola be put out of his misery or have his right front leg amputated. Everyone at Raahat felt Rola deserved a chance. He received emergency surgery on April 11 to amputate his leg. Volunteers and staff continue to provide the best medication and care for Rola. "But it is from here onwards that Rola faces a very uphill road to recovery," the Facebook post said. The organization is working to arrange for Rola to be brought to the proper facilities so that he may receive the best post-operative care. In the meantime, a donor has arranged to get him a mattress so that he doesn't have to rest his emaciated frame on scratchy hay. A shelter volunteer named Sushma crafted a temporary sling for Rola until he can receive a made-to-measure one. The volunteers continue to put in long hours to care for Rola, though his future is uncertain. However, his caregivers won't give up because they feel Rola deserves a real chance in life. "Let us do our best and hope for the best," the Facebook post said. If you would like to help Rola, consider making a donation here. Follow Rola's progress on Facebook here.